Total revenue of $56.7 million in 2018, as compared to $45.4 million in 2017. Revenue from asset management operations of $12.5 million, representing a new and recurring revenue stream in 2018. Revenue from real estate services of $3.0 million in 2018, compared to $2.0 million in the prior year. G&A expense decreased 76% to $1.3 million in 2018, compared to $5.3 million in the prior year. Cash flows from operating activities increased to $16.3 million, compared to $4.7 million in the prior year. Notes payable decreased to $18.9 million at December 31, 2018 from $39.4 million at December 31, 2017. Wind down of for-sale homebuilding operations is substantially complete with remaining inventory of 29 for-sale homes expected to be delivered mid-2019. Net loss attributable to common stockholders of ($4.5) million in 2018, or ($1.22) per diluted share, including impairment charges of $2.2 million related to our exit from homebuilding, as compared to net loss attributable to common stockholders of ($4.1) million in the prior year, or ($1.21) per diluted share. While the Company has developed numerous properties in multiple key markets throughout the southeastern United States during its more than 30 year history, and our reshaped management team has significant experience growing and managing large, national-scale portfolios, we believe the Washington, DC region provides an excellent long term growth opportunity. Additional information regarding our new business strategy, management team, assets under management as well as the Company's latest investor relations presentation describing the strategic vision of the Company can be found at our new investor relations website, which can be found at www.ComstockHolding.com. 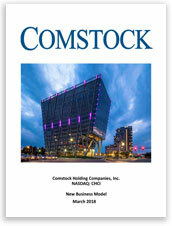 Comstock Holding Companies, Inc. (the “Company” or “CHCI”) is a multi-faceted real estate development, asset management and real estate related services company that, since 1985, has designed, developed, constructed and managed several thousand residential units and millions of square feet of residential and mixed-use projects throughout the Washington, DC metropolitan market and in other key markets in the southeastern United States. In early 2018, CHCI transitioned its operating platform from being primarily focused on developing on-balance sheet, for-sale homebuilding projects to being focused on commercial real estate development, asset management and real estate related services. As a result, CHCI began operating through two real estate focused platforms, CDS Asset Management ("CAM") and Comstock Real Estate Services ("CRES"). 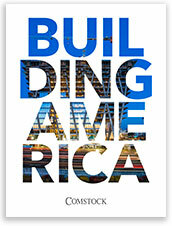 CAM provides real estate development, asset management, and property management services, while CRES provides development supply chain services, including capital markets, real estate brokerage, environmental consulting and design services in the Washington, DC metropolitan area, New Jersey and Pennsylvania. Anchoring the transition of CHCI is a long-term asset management agreement covering two of the largest transit-oriented, mixed-use developments in the Washington, DC area; Reston Station, a 4.5 million square foot transit-oriented, mixed-use development located in Reston, VA, and Loudoun Station, a 2.5 million square foot transit-oriented, mixed-use development in Ashburn, VA, as well as other additional development assets. CHCI’s substantial experience in entitling, designing, developing, and managing a diverse range of properties including apartments, single-family homes, townhomes, mid-rise condominiums, high-rise condominiums and mixed-use (residential and commercial) properties, as well as large scale commercial parking garages and infrastructure projects, has positioned the Company as a premier developer and real estate related service provider in the mid-Atlantic Region. The Company is a publicly traded company, trading on NASDAQ under the symbol CHCI. For more information about the Company, please visit www.ComstockCompanies.com. Strategically located midway between Tysons Corner and Dulles International Airport, Reston Station is among the largest mixed-use, transit-oriented developments in the Washington, DC area. Covering nearly 40 acres spanning the Dulles Toll Road and surrounding the Wiehle Reston-East Station at the terminus of Phase I of Metro's Silver Line, Reston Station is already home to more than 1,000 residents, numerous businesses, multiple retail establishments, and several restaurants. With more than approximately 2 million square feet of completed and stabilized office and residential buildings, more than 2 million square feet of additional development in various stages of entitlement, development and construction, and a 3,500-space underground parking garage and transit facility adjacent to the Wiehle Reston-East Metro Station, the Reston Station neighborhood is taking shape and quickly becoming Fairfax County's urban focal point in the Dulles Corridor. For more information about Reston Station, please visit; www.RestonStation.com. Located at the terminus of Phase II of Metro's Silver Line, minutes from Dulles International Airport, Loudoun Station represents Loudoun County's first (and currently its only) Metro-connected development. Loudoun Station has approximately 700,000 square feet of mixed-use development completed, including approximately 357 residential units, 50,000 square feet of Class-A office space, 118,000 square feet of ground floor retail spaces, and a 1,500-space commuter parking garage. Approximately 2 million square feet of additional development is slated for Loudoun Station. The Loudoun Station neighborhood represents Loudoun County's beginning transformation into a transit connected community with direct connectivity to Dulles International Airport, Reston, Tysons Corner and downtown Washington, DC. As Loudoun County's only transit connected neighborhood, Loudoun Station has become the new downtown of Loudoun County in the Dulles Corridor. This release includes "forward-looking" statements that are made pursuant to the safe harbor provisions of the Private Securities Litigation Reform Act of 1995. These forward-looking statements can be identified by use of words such as "anticipate," "believe," "estimate," "may," "intend," "expect," "will," "should," "seeks" or other similar expressions. Forward-looking statements are based largely on our expectations and involve inherent risks and uncertainties, many of which are beyond our control. Any number of important factors which could cause actual results to differ materially from those in the forward-looking statements include, without limitation: completion of Comstock's financial accounting and review procedures; general economic and market conditions, our ability to compete in the markets in which we operate; economic risks in the markets in which we operate, including actions related to government spending; delays in governmental approvals and/or land development activity for the projects we manage; regulatory actions; fluctuations in operating results; our anticipated growth strategies; the reliance of substantially all of our revenues derived from our provision of asset management services to a limited number of companies; the potential termination of our anchor asset management agreement with our affiliate and of our other continuing relationships with our affiliates. Additional information concerning these and other important risk and uncertainties can be found under the heading "Risk Factors" in our Annual Report on Form 10-K, as filed with the Securities and Exchange Commission, for the fiscal year ended December 31, 2018. Our actual results could differ materially from these projected or suggested by the forward-looking statements. Comstock claims the protection of the safe harbor for forward-looking statements contained in the Private Securities Litigation Reform Act of 1995 for all forward-looking statements contained herein. Comstock specifically disclaims any obligation to update or revise any forward-looking statements, whether as a result of new information, future developments or otherwise.